Timelessly beautiful, this sparkling 9ct white gold diamond ring showcases an illusion set diamond in the centre, with a halo of diamonds crafted around the band and diamond set shoulders. 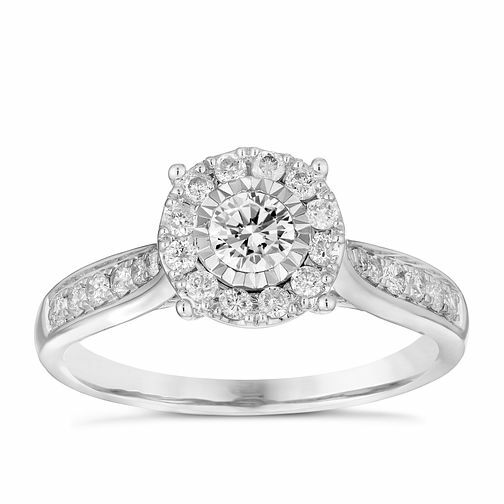 A striking 0.50 carat ring that will make the ideal diamond engagement ring for that special someone in your life. 9ct White Gold 0.50ct Diamond Illusion Set Cluster Ring is rated 4.3 out of 5 by 3. Rated 5 out of 5 by Anonymous from Amazing This ring is one of a kind. It’s so beautiful when I was proposed to with it I was lost for words I couldn’t believe my eyes. So many have stopped me to comment on how beautiful it is. Couldn’t be happier. Rated 4 out of 5 by Anonymous from Sparkle sparkle My now fiancé brought me this ring when he proposed, when he opened the box the sparkle and shine from the diamonds was overwhelming!! I couldn’t believe how amazing it was and even more so on my finger, the amount of comments I’ve had even from complete strangers is crazy!! The photos DO NOT GIVE THE RING JUSTICE!! I love it! !